The ancient parish was Barragh and Moyacomb. 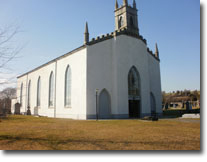 The church of Barragh was destroyed by Cromwell’s soldiers in 1650. A Patron day took place here until 1798. The holy well known as Cranevane was restored for Jubilee 2000. The word Moyacomb is from the Irish Magh-da-Chon meaning the plain of the two hounds. It is the ancestral patrimony of the O’ Neill’s of Leinster. The village of Clonegal on the river Derry was near where the coach roads from the midlands, Kildare and Dublin converged. It is often asked why the church is so big (Barn Type) and the reason is that it was constructed around the previous thatched chapel then in use. When the church was completed the old building was taken out through the doors of the new church. This old church had in turn replaced another thatched church which had been situated about a mile up the road to Monaughrim in a place called Knockafaugh (the long hill). The stone for the new church came from a quarry in Monaughrim. The ceiling has beautiful work done by Italian artisans. The bell tower is pointed with four miniature spires. The most important feature of the Sanctuary area is the paired Corinthian columns, flanked by pilaster and surmounted by an open pediment. In the year 2000 a Jubilee Cross (by Brendan Dunbar of Courtown) was erected just inside the entrance gates to the church. Keeping in touch with modern times St Brigid’s Church now has an electronic bell system. Parochial House, Myshall, Co. Carlow.